The entire process went smoothly and was made possible by Penchura, LLC. Our playground will bring joy to the community for many years to come! ” I want to compliment your design staff and installation staff on their work. The Play structure functions very well and meets the needs of a wide variety of ages and fits the landscape very well……I want to commend you on assembling a great team and group of sub contractors. I would highly recommend Superior Play to other communities or agencies that are considering installation of new playground equipment or park furniture. We would like to let you know how very satisfied we are with the products that we purchased from LSI for our all-accessible playground, Playground Adventures, located in Ypsilanti, Michigan! 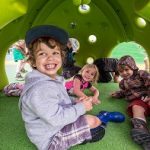 The community is so happy with the playground; and every day that the weather allows for outdoor play, the playground has “company”. Truly, our playground is “one of a kind” from the design through the community build. Thank you for creating such a wonderful product for us to buy. Thanks so much for sending the pictures, we’ve already forwarded them to Grandparents. I’ve never seen Olivia look so happy on a playground. We appreciate all your hard work…and now that the weather is nice, I’m sure she will be out there a lot. Just wanted to let you know how appreciative we are of Doug and Ken. Saturday was an amazing day! It’s been a pleasure to work with you all throughout the process.